Please enjoy reading our latest news below. The Storey’s Field Centre and Eddington Nursery has been awarded a prestigious Civic Trust Award. The building received recognition for positive contribution to the local community as well as showing excellence in design and accessibility. Designed by architects MUMA, the building also received the Special Award for Sustainability. The accolade is presented to one winner who demonstrates excellent sustainability credentials in terms of overall design, materials, construction and long-term energy use. The Cricket World Cup will be visiting Eddington, part of the North West Cambridge Development, as part of a worldwide tour. In a morning of cricket events at Eddington from Cambridgeshire Cricket Board, visitors will be able to play cricket, try new forms of the sport, and have their picture taken with the famous trophy. The event, on Sunday 28 April, will feature an All Stars Cricket session from 9.30am and a women and girls’ Softball Cricket session from 10.30am. Eddington was shortlisted for three awards at the RIBA East Awards. 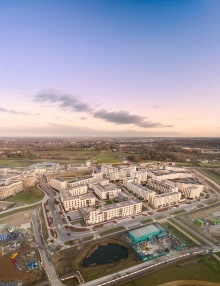 AECOM were listed for the Eddington masterplan, Mole Architects and Wilkinson Eyre for their Key Worker Housing apartments and Robin Lee Architecture for the utility buildings across Eddington. The winners will be announced in May at an awards ceremony in Cambridge. Outdoor activities to help children age 6-12 gain confidence and new skills. Every Wednesday at the Storey's Field Centre. Bring your toys to this Swap Shop and exchange and recycle with others. At the Storey's Field Centre on April 13 from 1.30pm.